Nerf Birthday Party Printable Templates – New! These camo Nerf birthday party printables have recently been added to the shop! These templates are perfect for a fun Nerf Birthday party! UPDATE: These Nerf printables are now also available in Blue camo! This collection of printable templates will make planning your Nerf birthday party easy! Instantly download the templates to your computer and personalize them at home using Adobe Reader. All fonts are embedded within the file, so you simply type over my sample text with your own party details. This 5×7 inch invitation is included in the Nerf Template Collection. Once personalized, you can print off as many invitations as you need. All of the text on these invitations is editable, so you can fully personalize them to suit your party. Decorate your party with this printable and customizable Banner. You can quickly print off the Happy Birthday banner included, or change the letters on each banner piece to create your own message. Print off the Banner Spacer (the bullseye) to separate words in your banner. Welcome guests with this full-page Welcome sign. As with all designs, this sign is versatile. Change the text on this sign to whatever you would like to say and print off again and again. There are also smaller 5×7 inch signs included. What Nerf specialist wouldn’t want their own personalized water bottle? Remove the wrapper around a small water bottle and wrap these labels around them. Find out how to cheaply waterproof water bottle labels too! Decorate your party table with these Nerf birthday party food labels. Type in the name of food you will be serving and place on your food table. Use them as Placecards too by typing in guest names instead of food! Take the fuss out of the birthday cake by printing off these cupcake toppers and inserting them into cupcakes instead. Simple and easy. See my Cupcake Topper tutorial for how to make them. Energy bars are perfect Nerf birthday party food! Wrap 1.55oz Hershey® candy bars with these wrappers for instant impact. Can’t find Hersheys bars where you live (such as Australia!)? I like to use 49g packets of M&M’s instead. These are the perfect size for a kids party favor. Send home your Nerf party favors with these tags. 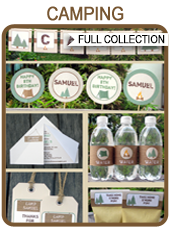 Personalize them, print, trim and attach to your favors. There are lots more Nerf Birthday Party printable templates included too! Want to see more before purchasing? See all the details and more images HERE IN THE SHOP!